Do you have tons of files taking up valuable space in your hard drive? It’s very likely that you do, but that you have no idea where they are, let alone the easiest way to access and dispose of them. 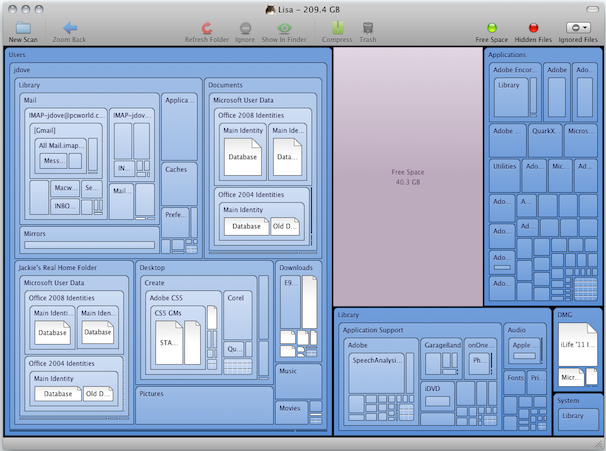 Space Gremlin 1.2 is a hard drive visualization utility that gives you a dynamic, almost architectural, view of your hard drive and every folder and file that’s in it. Space Gremlin—personified by the likeness of a snarky, yet friendly little green creature—uses an algorithm called squarified treemaps, which lets you pinpoint which folders are taking up the most space and decide what to do with them. You can generate a map of your entire hard drive, or zoom into specific volumes such as a Time Machine backup, public folder, Bootcamp partition, or network drive. It also works with FileVault. I even attached my fourth-generation iPod, chock full of files, to see a map of media, image files, and random backup files I saved from 2003. The Space Gremlin window has a pleasing gradated blue color that coordinates with the folder hue and contrasts nicely with its white documents. The deeper you get into the drive’s hierarchical structure, the lighter the color. Mousing around the interface shows you the app’s tooltips, which give you the names of each of your files. The color scheme makes it easier to see the contents of your drive and the relative amount of space its various components occupy. Once you have the big picture of your hard drive’s contents, it’s time to make some decisions on what to do to alleviate the overcrowding. This version of Space Gremlin lets you compress large folders and trash files directly from the program’s interface. While double-clicking will not open a file, it identifies the file, and lets you locate it in the finder where you can then open and view it. Performance was speedy. It took less than 4 minutes to scan my entire hard drive, though it took longer to compress a large folder into a ZIP file. The larger the file, the longer it takes to scan and generate the visual representation. You can choose what you want to focus on, for example, you can visualize your entire hard drive, or just your home folder, picture folder, or movie folder. After compression, you’ll have to manually delete the uncompressed files, however. Networked drives are slower for all operations, unsurprisingly, and you can’t trash files from drives on a network. Space Gremlin has a transparent and responsive interface. Click within the border of any folder and it will zoom to show you only the contents inside it. Each file and folder is automatically generated in proportion to the amount of space it consumes relative to the rest of the files. To enlarge the default window, just drag the lower right-hand corner and everything dynamically resizes. Or you can make the map full screen. You can also save these files as PDFs for reference. A toolbar at the top of the Space Gremlin window aids navigation. You can use the toolbar to scan a different folder and move back and forth among the file hierarchy as you zoom in and out of different folders. A Refresh Folder command lets you rescan folders. You can also selectively ignore folders using the Ignore button, which lets you select a folder to remove from the map you’re looking at. It does not change the structure of the folder, just what you see, so you can concentrate on content you’re interested in. Space Gremlin 1.2 is a swift, excellent file management tool that gives you analytical data about your hard drive and facilitates a number of simple actions. It’s easy to use, attractive to look at, informative, and best of all, it just works. Even if you don’t want to clean out your drive immediately, seeing how everything is arranged is a revelation.